G'd morning! 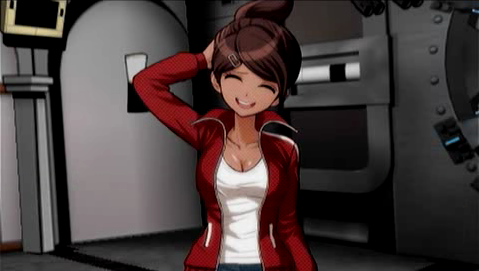 I'm Aoi Asahina! Nice t'meet you! 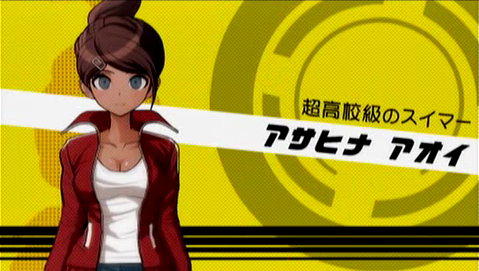 Asahina is played by Chiwa Saitou, perhaps most famous for her role as Natsuki in Sgt. Frog. 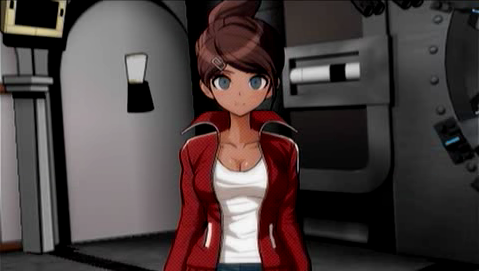 Aoi Asahina... She has broken records in every competition she ever participated in, all the way from elementary school to high school. She was even recently chosen to be a representative at the olympics. A "Super High-school Level Swimmer". She has perfect strength, figure, proportions... and talent to boot. People often make a big fuss about her on the net. Um, what was your name again? Sorry, seems I forgot it. Right, right! I knew it was something like that! It wasn't something like that, it was exactly like that. Sure, sure, I got it now! I won't forget again, promise! As she whispered my name, she started writing something with her finger on the palm of her hand. What, you've never seen this before? They say when you want to remember someone's name, you should write it on the palm of your hand three times! 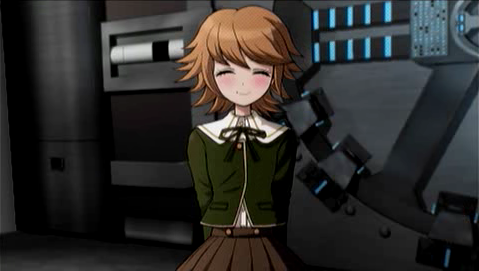 Hey, what characters do you spell "Naegi" with? Japanese names often involve special readings of kanji characters, and in many cases theres no way to know how to spell someones name unless they tell you. 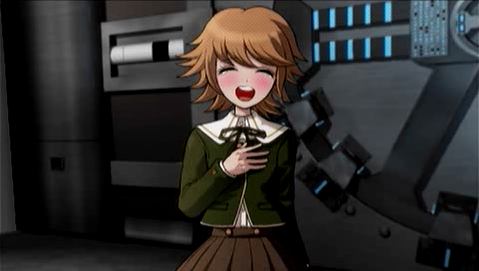 In Naegis case, though, most Japanese native speakers will get it right on their first try. Ha ha, I can't remember how its written. I promise I'll check in a dictionary later! But anyway, really nice meeting you! Whatever else, she seems to have an endless supply of energy. How do you do? 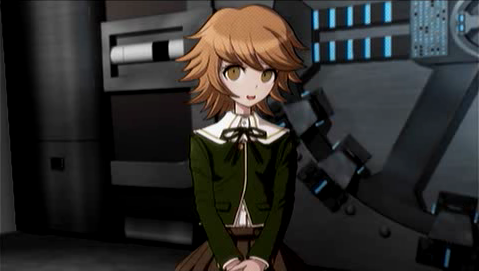 My name is Chihiro Fujisaki. 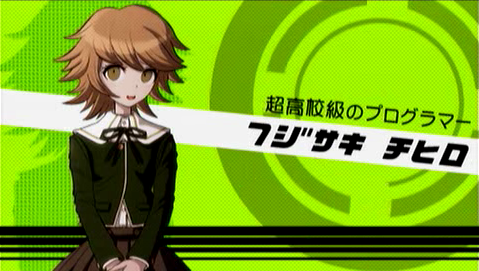 Chihiro is played by Kouki Miyata, whos expertise is voicing children and young boys. But nice to meet you! Right back at you. Pleased to make your acquaintance. I'm probably just imagining things, but did we ever meet somewhere before? Nope. I don't think we have ever seen each other before right now. Y...you don't have to apologize, you know. Chihiro Fujisaki. The genius programmer behind numerous innovative software, often called a "Super High-school Level Hacker". Furthermore, the fact she looks just like a small frightened animal gained her many rabid fans. Eh? Why are you apologizing again? It's just that you look a little... displeased. You're not angry with me, are you? No, no! I was just thinking about something else! That's right! 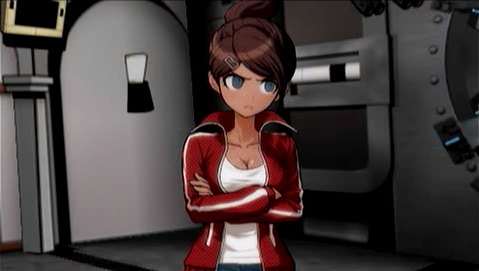 I'm not displeased or anything. Oh, thank god! I thought you didn't like me. I think I understand the rabid fans a little. Um, can you tell me your name? 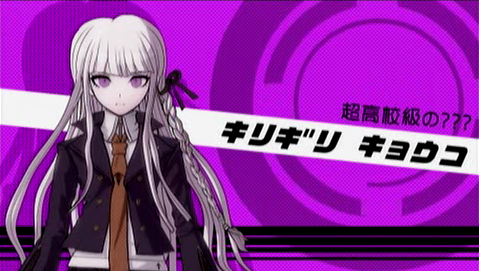 My name is... Kyouko Kirigiri. 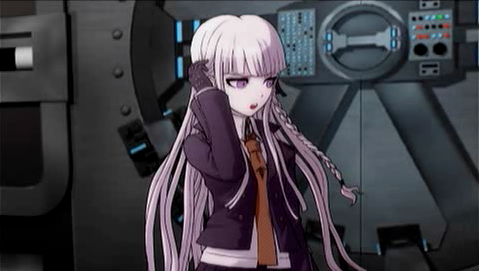 Kirigiri is voiced by Youko Hikasa. At the time the game was released, she was in the process of becoming very very popular for playing fan-favourite Mio in last years mega hit show K-On!. 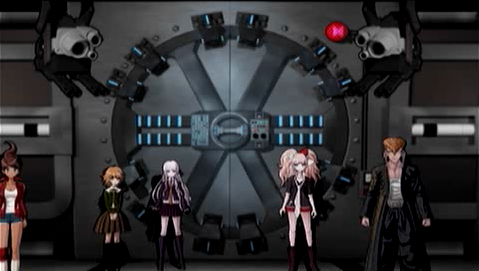 Kirigiris name is one of the few in the game that may carry hidden meaning. 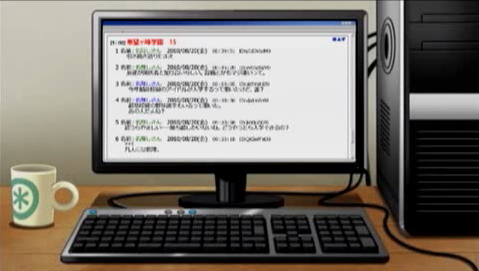 The kiri part is spelled with the character for fog, and the giri with the character for cut. She sure is a quiet girl. And then theres her name. 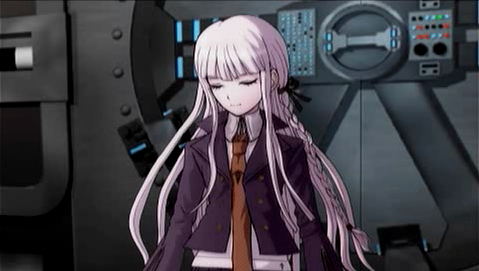 Kyouko Kirigiri. 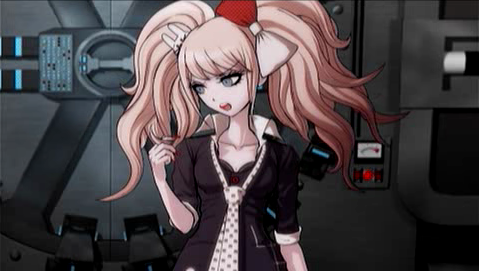 I don't recall seeing that name in the Hope's Peak Academy thread. 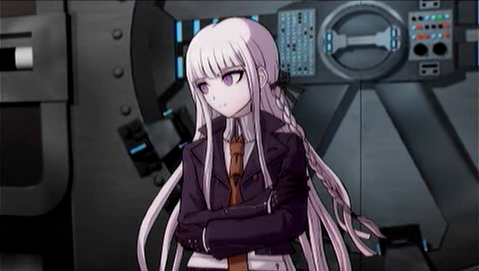 That's right -- excluding me, among Hope's Peak Academy's new students there was one more whose talents were unclear. Um, hey, so why did you come to this school? What do you mean by "why"? It's just that you must be some kind of "Super High-school Level" something or other to be chosen to attend here, right? So what super-talent do you have? And why... do I have to tell you that? If I don't have to, I think I won't. ...it's like she's wearing an iron mask. If she won't tell me there's no way to know. Yoohoo! 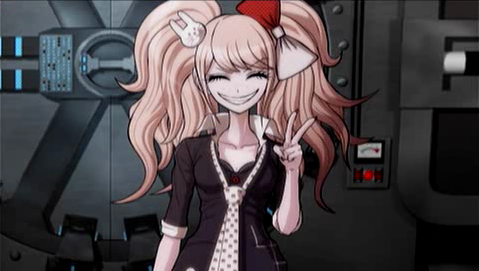 My name's Junko Enoshima! Great to meet you! 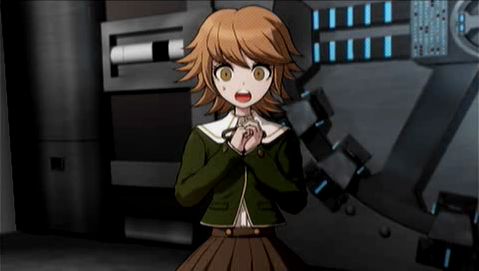 Enoshima is played by Megumi Toyoguchi. 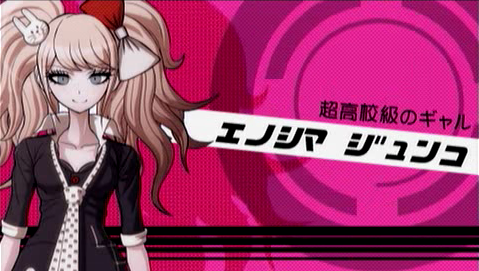 Were back to the cast of Persona 3 now -- Toyoguchi voiced Yukari in that game. 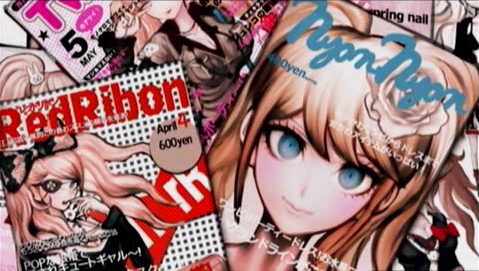 One of the most charismatic high-school girls in the country, a "Super High-school Level Fashion Girl". These days, editing the photos in a magazine is just the way things are done! 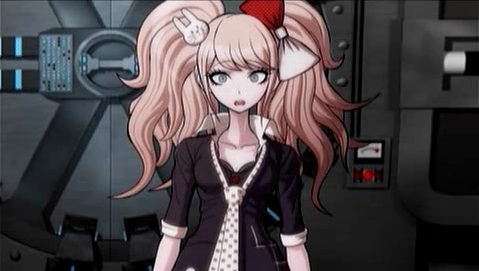 I mean, shouldn't you be even more surprised about a certain singing princess? They're always making her eyes so big and her skin so ceramic, after all! I feel like all my dreams are shattered. 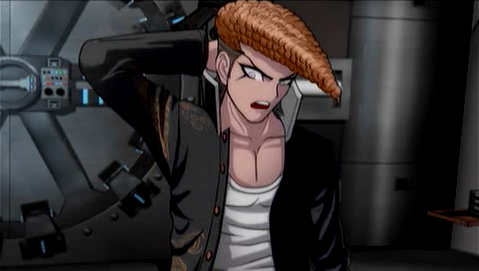 My name is Mondo Oowada. Nice to meet you. 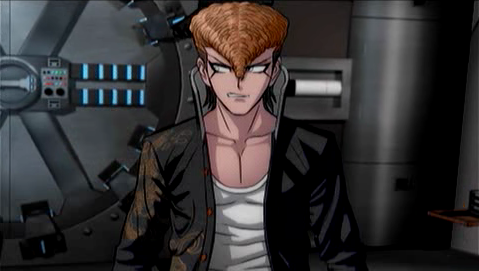 Mondo is played by Kazuya Nakai, who plays lots of anime manly men. He was also Wakka in Final Fantasy X. Some time ago he took over Japan's largest, fiercest motorcycle gang, and reigns as their leader. Punks all over the country respect and fear him. 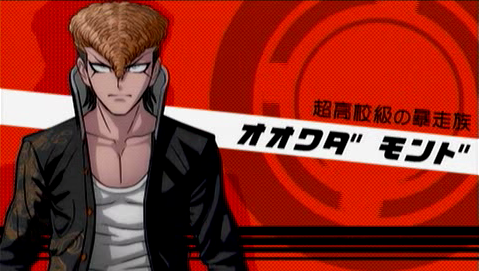 A "Super High-school Level Gang Leader". I'm also... pleased to meet your acquaintance. I should be careful how I act around this man. It's not hard imagining being "put down" if I say something he doesn't like.